We built these walls in 2011. This photo was a year or so later just before the family moved in. 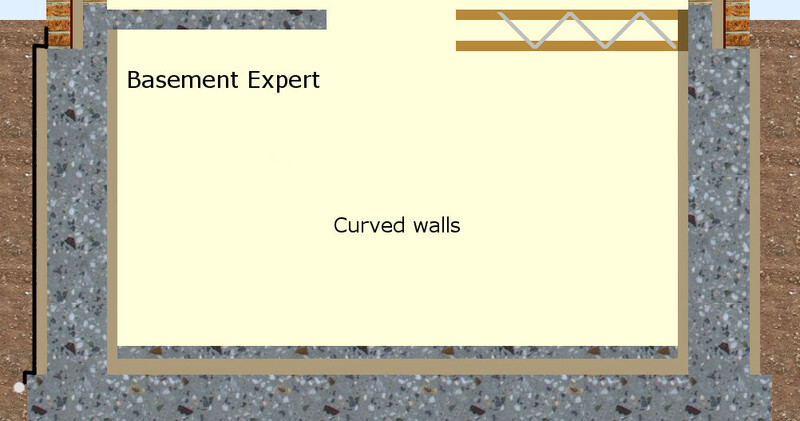 I only made curved walls once since becoming a basement specialist in 2004. Most of these photos are from that project. We were still using a polystyrene ICF, in those days. With hindsight, it would have been more work to reduce the width of the upright boards inside to get the radius required but much easier because we could have simply screwed the horizontal straps to timber. Before that, on big projects, I saw them formed a few times. 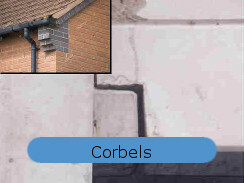 The top had to be corbelled out so that, starting inside, he could have a bearing for a beam and block floor; then the waterproof concrete upstand upon which inner skin blockwork was to be built, then space for insulation that would continue into his cavity wall, finally the extra corbel is for face brickwork. Clearly this ICF. But we could not just rely on the plastic ties, we had to seriously brace with timber - which is why it did not burst or go out of shape. Any radius is achievable. Radius curves, parabolas or S shapes. But the theory of what goes on is entirely different to a straight wall. This contractor used FastForm and steel sheet bought specially for the purpose. Where the wall was straight he used FastForm and plywood. 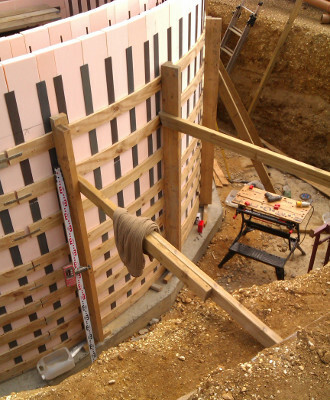 The issue with hiring a system like FastForm, which is an excellent system for basement retaining walls, is that the amateur works slowly while he gets to know how to use it most effectively. Therefore, the amateur's hire cost is high. Probably 2 to 3 times the hire cost a professional would need to pay. 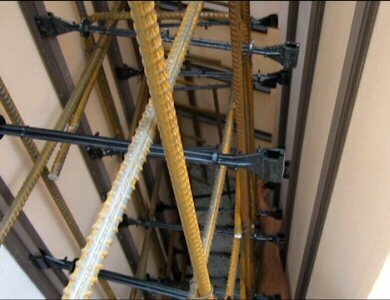 In a straight wall the threaded rods control the width of the concrete and the props merely have to keep the formwork upright for all the weight to go down to the solid floor beneath. I always say it is like holding a scaffold pole upright. As long as it does not begin to lean over it is easy to keep it where it is; but if it leans more than a few inches it is very heavy indeed and may defeat you and fall over. A curve is like a straight already leaning over. The weight of the concrete will find that it can spread and increase the circumference length. Because the boards need to be vertical the weight of the concrete will try to push the boards out, making the wall lean over thus getting a little more concrete in. And if that process was allowed to begin it would burst the wall open in a moment. 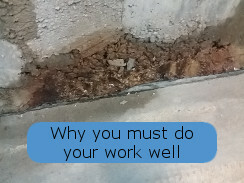 I do not fill walls with concrete in one go because I could neither properly deliver nor properly compact concrete 3m down through 2 lines of reinforcing steel. 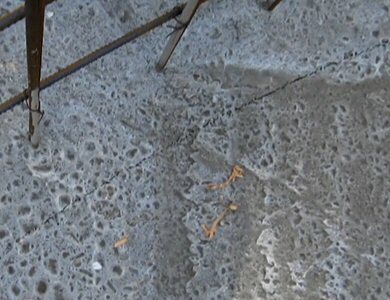 For all sorts of failures of workmanship the concrete would not be waterproof. 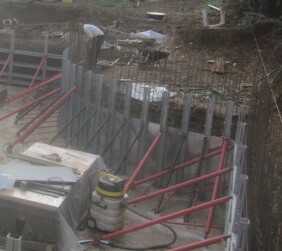 An additional set of difficulties with the ICF I used was accommodating a precast concrete floor inside as well as waterproofing horizontally with an upstand. We began with full boards that we cut off on the outside to the underside of the corbel. When we filled with concrete the first time we only filled to the underside of the reinforcing steel yet to be tied on to support the corbel. 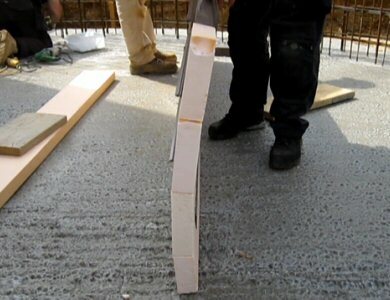 Therefore there was not going to be much concrete pressure at the top which is why the strapping got further apart. 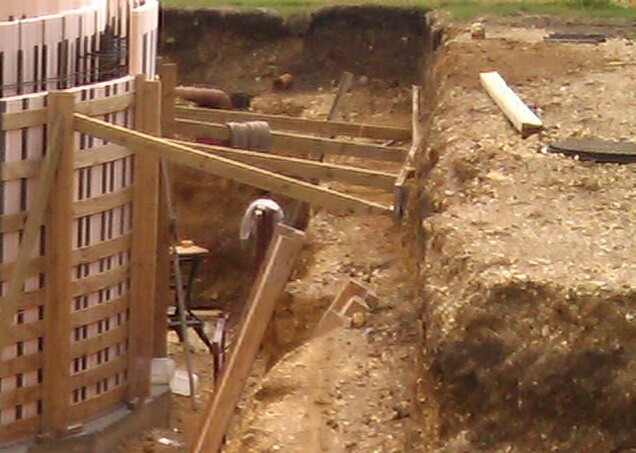 The bracing off the excavation was necessary because it was difficult to fix the end of the curve on the outside strongly to the end of the straight that meets it. The curve could have survived but moved as a single entity. And so to the process in chronological order. We found the radius point and put in a screw with a plug. 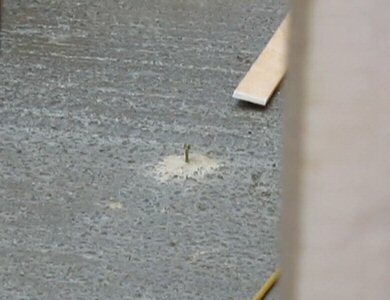 We used a strip of ply and drilled a hole the radius length from one end and used this screw through that hole. That meant the other end swung around (like a school compass) and we scribed the arc with a pencil. 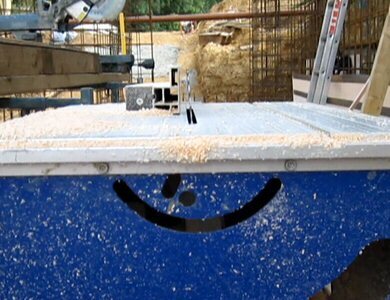 In fact, we reduced the radius length by a thickness of ply; fixed these brackets then a rip of ply to the brackets. So the other side of the ply is exactly the wall radius. On a compound saw we cut grooves in the ply to allow the ply to bend. We calculated on a spreadsheet how much narrower the panels needed to be on the inside than the outside. We cut this much off, at an angle, on the table saw. Then we put a few of these panels together. I think that with scaffold boards we will have to put ply down to the ground with brackets both sides. 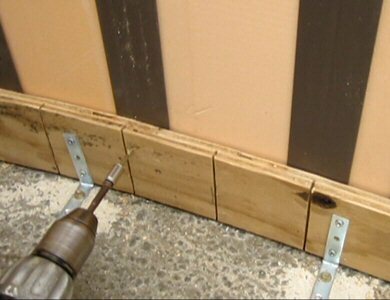 As each board is added it will be fixed at the bottom and higher up to a similar rip of ply. On the inside those higher rips will be fixed to props first. It might be necessary to have temporary props outside as well. I think that the threaded bars will go through 6x3 uprights as usual but far more of them, perhaps every 400mm horizontally. From this point on we added board both sides then track both sides then the ties and so on. You can see here that occasionally we needed a pair of narrower boards because the outside boards on 200mm centres fell behind the steel uprights also on 200mm centres but a slightly different radius. Another issue I noticed was that after 3m or so of wall the men were asking for a tapered board because the end of the wall that far along was not upright. 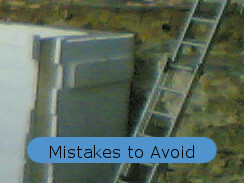 When I investigated I found that the wall was being knocked out of upright by hammering the tracks on to the foam. When I sorted out the upright issue, the need for tapered boards disappeared. 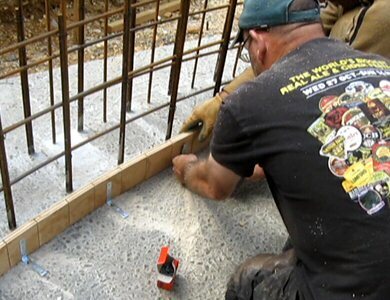 You have to adopt the 'mindset' of wet concrete. 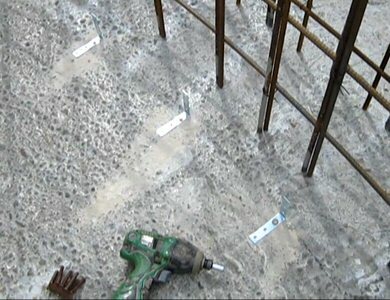 If there is any way it can distort the formwork to get more concrete in, it will. 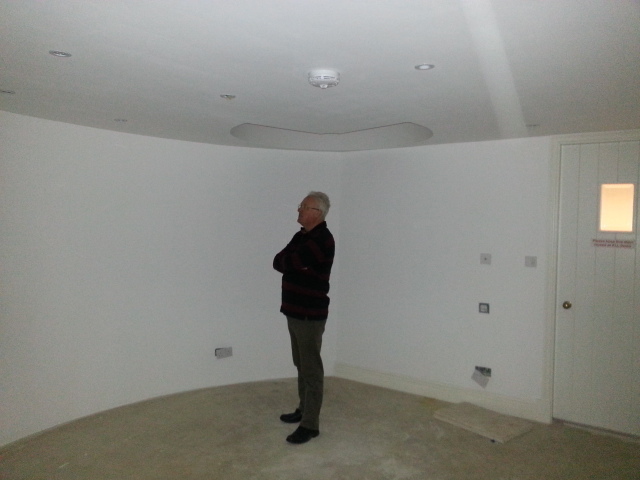 When these two curved walls were finished they were as accurate at the top as they were at the bottom. 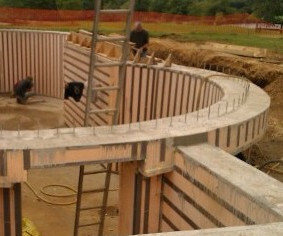 Curved walls will be far more time consuming than straight walls. But in terms of materials the cost will be about the same. A small bit of curved wall might add panache to your project worth the extra time it took to form.